If you're excited about Stadia, and you're looking to run it on your TV, the most effective way of doing that is using Google Chromecast. Grabbing a great Google Chromecast deal now will mean that you're not only set for the future of gaming, but you're also able to enjoy apps on your TV and the ability to share content between mobile devices, laptops, tablets and your 4K panel. While you can just get regular Chromecast boxes for less than $50, we'd recommend getting an Ultra version which handles 4K and HDR, as many games on Stadia will be available in that resolution. There are usually Google Chromecast deals to be found throughout the year, on all formats of the device. No, the price isn't massive to start with, but it's always good to save a few pennies. One thing to note is that you're unlikely to find Chromecast on Amazon because, well, it's a direct competitor to some of Amazon's products like the Firestick, so you'll need to shop elsewhere. There are various forms of the Chromecast too, and we'll list the best prices for each of them below. It's not yet clear how Chromecast actually enables Stadia, but it'll likely come through an app, or via sharing from another device. We'll update this feature as more details become available. If you're looking for the standard Google Chromecast model, this one will do the job for the lowest price. 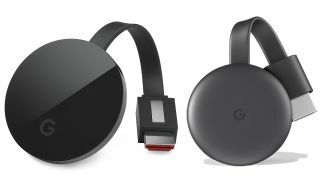 While it's not a huge upgrade on the older Chromecast 2, this third-gen model does load and prep video content a little quicker, so it's definitely the minimum you'll want for Stadia (which won't launch until later in 2019 anyway). The only downside is that the Chromecast 3 doesn't do 4K, so if you're looking to stream above 1080p, you'll need the Ultra, which is below. What's likely to happen is that Google will release a 4th gen Chromecast when Stadia launches, but it's unlikely to be a big change from the 3. If you're looking to future-proof yourself and stream 4K content, then you need the Chromecast Ultra. This allows you to pass 4K video and audio to your TV from whatever device you want, and it's what Google demoed Stadia on during the live reveal at GDC. While Google also boasted it'd be doing 8K streaming, don't expect that for years to come - the Ultra will serve you well through this generation of games and the next. Let's not forget that Stadia is compatible with all current controllers, so now might be a good opportunity to grab a fresh PS4 controller. The DualShock 4 is one of the best designed controllers of recent years, so we'd recommend playing games on this one. Google is building its own device, but that hasn't been tested yet, and kinda looks like a cheap 3rd party pad right now. If you prefer your controller to be Xbox flavored, sure, that should work with Stadia too. Here are the cheapest prices on Xbox pads, just in case you want to stock up now.